Enological tannins offer the winemaker the possibility to add refined, highly-bindable tannin to your wine at any stage during the process. Benefits can include increased structure and mouthfeel, color stabilization, stability, anti-oxidative qualities, and overall complexity. Tannins can reduce vegetal/herbaceous characteristics and perceived astringency. 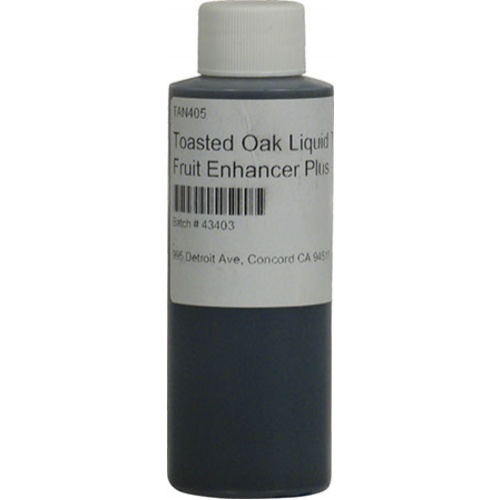 New Liquid Oak Tannins produced by Toasted Oak Inc. are water based, French Oak Tannin concentrates, designed to easily integrate smooth and flavorful oak character into a wine, without the cost or hassle of traditional oak barrels. While powdered tannins are similarly cost effective, there will be some loss of flavor and texture due to the high temperatures necessary to evaporate all liquid out. Liquid Oak Tannins are the perfect balance of oak barrel flavor, and pure tannin cost. Aside from the beneficial flavor impact of these products, they are also easier to add to the wine and assure even dilution. These Liquid Oak Tannins are for red and white wines. Please do bench trials carefully when considering their use in white wines. Additions may cause filterability(and stability) changes. Do not exceed 30% of normal red wine dosing for white wines. Fruit Enhancer Plus has more proanthocyanidic tannin components to emphasize a ripe berry character and a fruity, aromatic style. It has to be carefully dosed as it will have a strong influence on the existing character of the wine. Works best on red wine to accentuate a ripe berry character (Black Cherry character). A 4 oz bottle of Fruit Enhancer Plus will treat 125 gallons of wine with a low dosage, or 47 gallons at a high dosage. Please see the Documents tab above for additional information as well as Bench Trial procedure. Trial run for fruit forward dry red.